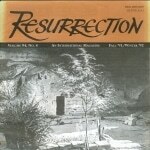 You are here: Home / Resurrection : An International Magazine / The Gospel Preached to the Dead ? The Gospel Preached to the Dead ? “Who shall give account to him that is ready to judge the quick and the dead. For this cause was the gospel preached also to them that are dead, that they might be judged according to men in the flesh, but live according to God in the spirit” (I Peter 4:5–6). “For this cause.” A construction that occurs elsewhere in John 18:37, and Romans 14:9, where it is rendered “To this end”. It speaks of something that is done with an object in view. The Lord is seen as “Ready to judge…the dead”. And it is “For this cause”, with this object in view, that “the gospel” was “preached also to them that are dead.” Preached “that they might be judged” — judged by the Lord — “according to men in the flesh.” “to them that are dead.” The dead as had been contrasted with the then living. “Who shall give account to him that is ready to judge the quick and the dead.” The dead as could have included all who had lived before — before the coming of the Lord and of the gospel of His resurrection. The Lord in speaking of his judgment of the dead made it clear that this would be preceded by their being raised — and necessarily so, for it is only as living, conscious beings that they can stand to give account of themselves before Him. “The hour is coming in the which all that are in the graves shall hear his voice, and shall come forth; they that have done good, unto the resurrection of life; and they that have done evil, unto the resurrection of damnation” (John 5:28–29). “For this cause was the gospel preached to them that are dead.” Or, “was good news preached to the dead”, for it is not necessarily what we term the gospel — the gospel of our Lord Jesus Christ — that is here intended. Men in former times had what to them was God’s gospel preached — good news in respect to which they are to be held responsible in the Lord’s day of reckoning. “For unto us was the gospel preached; as well as unto them; but the word preached did not profit them, not being mixed with faith in them that heard” (Heb. 4:2). And these were the generation of Israel who perished in the wilderness. And the Gentile world was help to be “without excuse,” since God had not left Himself “without witness” there being in creation itself sufficient testimony to His eternal power and Godhead (Rom. 1:20, Acts 14:15–17, 17:26–27). “The they might (on the one hand) be judged according to men in the flesh.” And judgment according to what is required of men in the flesh is a principle which God has made operative in every generation and under every administration. Ecclesiastes states it thus, “God shall bring every work into judgment, with every secret thing, whether it be good, or whether it be evil” (12:14). And the Epistles affirm the same: “For we must all appear before the judgment seat of Christ; that everyone may receive the things done in the body, according to that he has done, whether it be good or bad (II Cor. 5:10, Col. 3:25). “But (on the other hand) live according to God in the spirit.” The antithesis here is between their judgment as to their responsibility in terms of their earthly life — “men in the flesh” — and their life in resurrection. God’s good news to men in every age has had resurrection in view. He gave promises the fulfillment of which could only be beyond the grave. Abraham looked for that city that has the foundation, a hope which led him to view himself as a stranger and sojourner on earth. But while good news of old time had this as its end it was not until the Lord’s resurrection that the manner of that life was revealed. The Lord was “Put to death in the flesh, but quickened (made alive) by the spirit” (I Pet. 3:18). He in resurrection is “The last Adam, a quickening — a life giving — spirit” (I Cor. 15:45). And it is through Him that the redeemed in resurrection shall “Live according to God in the spirit.” “According to God” because His is the life wherewith they shall eternally live — the life of God in Christ. “As the Father has life in himself; so has he given to the Son to have life in himself.” “As the living Father has sent me, and I live by the Father; so he that eats me even he shall live by me (John 5:26, 6:57). “For this cause was good news preached also to them that are dead that they might…live according to God in the spirit.” God’s witness to men has had life in view — resurrection life, God’s own given eternal life. And men have “by patient continuance in well doing” sought for “glory and honor and immortality, eternal life.” A seeking which has been granted full fulfillment — fulfillment now on the revealed foundation of the Lord’s life, death and resurrection. This — if it is how I Peter 4:5–6 is to be understood — is in accord with the Scripture’s testimony as to the state of the dead, that they sleep, that they know not anything. They die answerable for what they have been as “men in the flesh,” but no more to know ought until raised by the Lord’s command. The passage has, however, been much confused in that the Reference Margin in many Bibles links it with I Peter 3:19 which reads “he went and preached unto the spirits in prison.” An association of passages which has been thought to imply that the Lord went and preached the gospel “to them that are dead” while they were dead. That the dead, as spirits conscious in some underworld, were then given a second chance — second to the opportunity they may have rejected in this life. The answer is that the Lord’s preaching after His resurrection was not to the dead, was not to men, but was to “spirits” — fallen angels held under detention for a very particular reason. “Christ…being put to death in the flesh, but quickened in the spirit, in which also he went and preached unto the spirits in prison, which aforetime were disobedient…in the days of Noah” (I Pet. 3:18–29 R.V.). Angels are created “spirits” (Heb. 1:7). And “God spared not the angels that sinned, but cast them down to Tartarus, and delivered them into chains of darkness, to be reserved unto judgment, and spared not the old world, but saved Noah” (II Pet. 2:4–5). The Lord “went and preached to the spirits in prison”; and the word is, proclaim as a herald. The Lord, the uncorrupted Son of Man, went and heralded His personal victory over death to these spirits who in the old world had corrupted the seed of man. A victory He had acquired by His own righteousness here in this scene of their former disobedience. News which to them was no news of hope and salvation, but rather of the Lord’s right, His right as the risen Man, one day to appear to judge and to condemn them. There is, therefore, no justification for associating these two Scriptures together. Was the Gospel Preached to the Dead ? No. “The spirits” to whom the Lord heralded His triumph were fallen spirits, angels who had sinned, held under arrest “reserved unto judgment”. The “men” in our passage, on the other hand, to whom good news was preached were “dead” — they had died with the responsibility of having heard. Copyright, 1992, Pastor’s Library Foundation. This article may be copied freely for wider distribution, providing that the source from which it is taken is suitably acknowledged. (Acknowledgment: Resurrection Magazine, Volume 94, Number 4, 1991; published by Pastor’s Library Foundation, Sterling, VA.) This notice must remain attached to article.